We are half way through the second test in Barcelona, and the spoils of the day go to Sergio Perez and his McLaren. who ended the day ahead of Sebastian Vettel in the Red Bull. 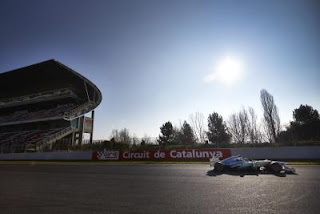 This was the last outing for both drivers at Barcelona for the second test, and they will hand over their cars to team mates Button and Webber respectively. Perez and Vettel both set their best times on single lap runs on the soft tyre before moving on to longer run race simulations in the afternoon. Vettel said, "We had issues with reliability and couldn't do as many laps as we wanted but it's better that these things happen today rather than in Australia. It was nothing dramatic, just small things. We had to stop the car once as we saw a small loss of pressure and then towards the end of the day it looks like after the stop the wheel wasn't on properly. We are pretty happy with the car, with the balance, how it feels." Raikkonen faced some issues for a second day running, but did manage to catch a snooze while the team worked on his car. Today it was a gearbox issue after yesterdays problems with data logging. Even though he managed to get out only later in the afternoon, he still managed to run 43 laps and set his best time with the medium tyre. Hamilton and Mercedes were the surprise of the day, setting their best time on hard tyre at the start of a ten lap run just before lunch time. He spent all morning comparing exhaust configurations, with and without the coanda channel exhausts. The second half of the day saw them concentrate on set-ups and longer runs on the medium tyres. 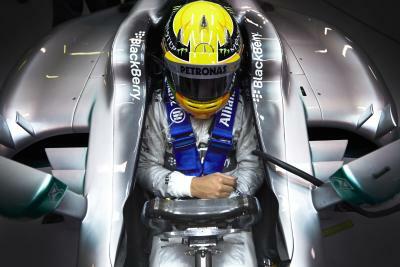 Hamilton hands over the wheel to Rosberg for day three of testing after completing 121 laps on day 2. Alonso closed off the top 5, one and a half seconds off Perez's pace and he set his time on the medium tyre. An exhaust problem, which might be related to the one we saw in Jerez, saw him complete just 76 laps by the end of the day. He has one more day of testing in the second test, before Felipe Massa gets back into the F138 for the final day on Friday. 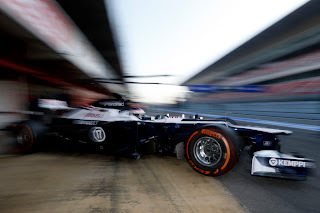 Bottas in the Williams seemed pretty excited with his first day in the car, and was very happy with the grip at the back of the car and the traction out of the corners. Mike Coughlan, the ex-technical head of McLaren who was ousted after the spygate saga, seems to have come up with a controversial but highly improved car. We will have to wait and see what version of the car is launched at the first practice session in Australia and what the stewards take on it will be. If it is passed, there could be a clamour among all the teams to develop the coanda exhausts based on Coughlan's interpretation of the regulations. Paul di Resta, who was behind Daniel Ricciardo in the Toro Rosso, was going through the paces before he hands over his car to Adrian Sutil and Jules Bianchi for their shootout to figure out who gets the final race seat available on the grid. Nico Hulkenberg finished off the time sheets ahead of the two not so new teams remaining in the paddock with Marussia ending up a full second ahead of the Caterham yet again.